Life Elevated is State of Utah’s war cry. And why not? Great ski locations and scores of State and National Parks make it an ideal outdoor hotspot. Tucked in the northern corner of the State, on the shores of Salt Lake, the city is an ideal gateway to soak in the sun and churn the powder. I was fortunate to be a part of an elite group of travel journalists and tour operators to tour Utah. We were hosted by the Utah Office of Tourism. For the next 6 days, we would be driving over 2000 miles exploring the many facets the State has to offer. I was in Boise for a business conference and a trade show. We drove from Boise to Salt Lake City. At our disposal was Chevrolet Suburban… a large van that could comfortably fit in 6 of us with loads of baggage. The journey was about 300 miles and lasted for about 5 hours. As we left Boise, potato fields took over the landscape. Most of the drive was on flat land and then the scene changed as soon as we crossed the Twin Falls. Mountains with fresh snow, lovingly called powder, dotted the horizon. Patti Denny, Manager Travel Trade Program, Utah Office of Tourism was our driver for the day. Tomorrow and for the rest of our trip we would be driven by Dave Hansford a colleague of Patti. Dave was one hell of a guy with plenty of knowledge about his State (and beyond). He certainly makes for a great tour guide. I wish him well. About an hour before reaching Salt Lake City, we crossed Golden Spike – a historic site that witnessed one of the most important accomplishments of the 19th century. On May 10, 1869, officials of the Central Pacific Railroad and Union Pacific Railroad met here to drive four symbolic spikes (two gold), celebrating the completion of the first transcontinental railroad. I was not aware that around Salt Lake City are locations that produce USA’s largest number of rocket components. The area is of prime importance to NASA. And just at the outskirts of the city is the Antelope State Park, a very popular island destination to view the beauty of Salt Lake, the peaks around as also herds of bison – popularly known as buffaloes in the US. Salt Lake is the largest of its kind in the Western Hemisphere with salinity four times that of Atlantic Ocean. Known as America’s Dead Sea, people can actually float in the Lake – they can’t drown even if they have to! We were in Salt Lake City at lunch time. Our lunch was hosted at Lion House Pantry Restaurant located in Temple Square. I liked the concept and the food of this restaurant – a fusion of fast food and fine dining! You pick up a tray and walk through the food on display – menu changes everyday – pile up what you like, pay the bill and out you go. I certainly recommend having at least one meal when in the city. 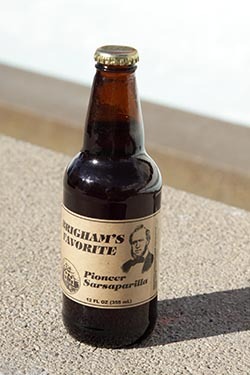 And yes, do try their Sarsaparilla – a fruity drink with fizz – that definitely beats regular sodas. Post lunch, we took a tour of the Temple Square area. This is one thing that visitors must do if nothing else. 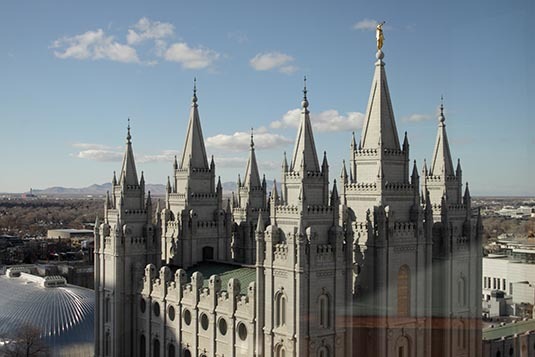 35 acres of fascination that includes parks, gardens, genealogy library, Mormon Tabernacle Choir (you will be delighted by the acoustics; each one of the 4000 audience present can actually hear a pin drop without microphones), museums, conference centre and of course the Salt Lake Temple. You can tour around for free! 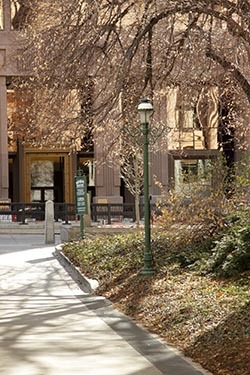 Just a few blocks away from Temple Square, is the site of “City Rising”. Three city blocks have been razed down to make way for a sustainably designed, walkable urban community of residences, offices and retail stores rising over the next two years on approximately 20 acres across three blocks in the heart of downtown Salt Lake City. Should be quite a destination when complete. After spending couple of hours in Temple Square area, we moved towards our destination for the night – Park City. 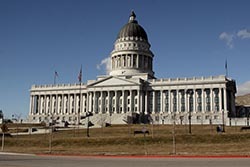 But not before driving through town, its broad streets, the Capitol Building and the awe inspiring Utah Office of Tourism Office building. Park City is just a 30 mile, 40 minute drive from downtown Salt Lake City. Essentially, Park City is a ski destination. The town has some great brand of hotels and I was told the ski fees are a bit too steep. But the flip side is the fact that visitors don’t have to pay for parking thus making the fee quite competitive! Park City is the location of the famous Sundance festival – which was actually started at Sundance located few miles away. Park City’s Main Street reminded me of a typical old European town – narrow street with restaurants and boutique stores on each side of the road. Our dinner was hosted at Shabu a free style Asian Cuisine. The place was jam packed and it was not even a weekend. Great food the place offers is the prime driver! For the night I was hosted at Silver King Hotel. I had a 2 bedroom condo for myself. Large enough for families with kids to hang around for days. I was OK in my small corner room – cozy to see me through the night.